I made this quick card for the Splitcoast Sketch Challenge #248 here. I can't say enough how easy, yet inspirational these sketches are to complete. 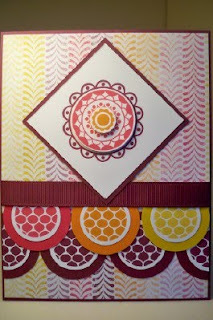 I used the Rose Red papers from the Thoroughly Modern DSP. Then the present stamp is from Holiday Blitz and the tag stamp is from Party Hearty. A little ribbon and viola! Happy Monday to you! I'm keeping up with the MojoMonday #106 sketch here. and just getting a head start on my Christmas cards. I used the Christmas Punch Hostess stamp set on this one. I inked up the main image with Soft Suede and Real Red markers and used the Real Red Classic Stamp pad for the snowflake. 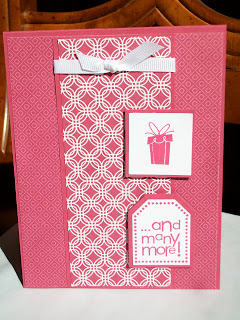 The Boho Blossoms punch coordinates with the three snowflakes stamp in this set. 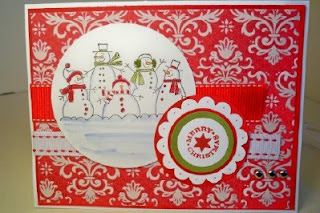 I popped the snowflake up with some Stampin dimensionals. Being a "red girl" at heart, I love to use the 3/4 inch Real Red polka-dot grosgrain ribbon too. 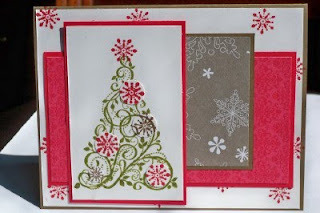 I made this Christmas card for the Stamping 411 challenge here. I'm a big ribbon fan so I thought I'd use one of the rolls of ribbon from Sleigh Bells. I used the Polka Dot background stamp (on the dormant list) to add something to the Real Red paper. 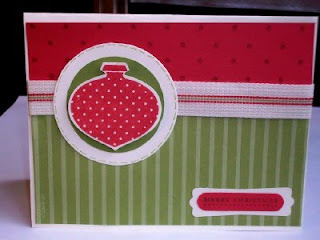 Then I used the polka dot ornament stamp from Delightful Decorations to coordinate with all the dots. The Old Olive striped paper is from the Patterns Designer Series Papers. 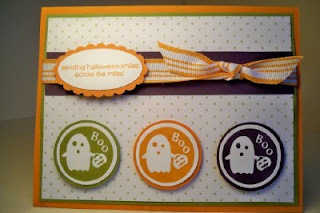 You gotta love punches too, they make for cute and quick cards! I made this card to cover two Challenges. First, the Splitcoast Sketch Challenge #247 here. And the Pals Paper Arts Inspiration Challenge here. Even though I used the Falling Leaves set on my last post, I thought it would be perfect to use with these fall-ish colors. And it just goes to show how versatile a stamp set can be! My inspiration colors that I chose were Soft Suede, Crushed Curry, Always Artichoke and Dusty Durango. And the Designer Series Papers are from Thoroughly Modern (Soft Suede), Razzleberry Lemonade (Crushed Curry) and To the Nines Specialty Papers (Always Artichoke). I used lots of different supplies on this card but it came together really fast because I just trace the dimensions from the sketch right onto my card stock and papers, then cut and layer. Another fun color combination at Splitcoast-Basic Black, Crushed Curry and Rich Razzleberry. Of course I had to use the Razzleberry Lemonade DSP. And my new Falling Leaves set arrived yesterday so I couldn't wait to ink that up! 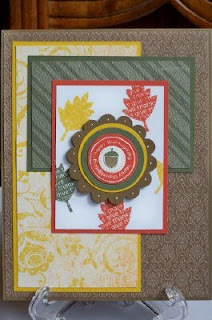 I used the Stamp-a-ma-jig to line up the leaves and layered the Curry and Black ribbons. Two black brads anchor the "grateful" sentiment. I needed something bright for my MojoMonday sketch challenge. So I decided to use the Razzleberry Lemonade Designer Series Papers. I also thought that the Circle Circus set would work well with the circles in this sketch. 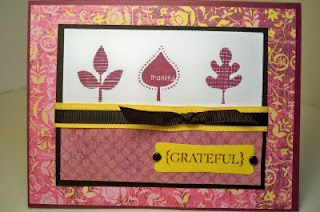 I popped up the main image twice with Stampin' dimensionals. The circle punches are an awesome tool to make quick projects. I made this card for another Stamping 411 sketch here. I immediately thought of a star for the triangular element and then thought of the Sporting stamp set. This is a really great set for any athlete in your life. And you can pair it with any of the other sports sets on pages 78-80 of the Idea Book & Catalog. I used the Night of Navy and Crushed Curry markers to color the stamp images. And the Large Star and Star punches layer perfectly. A silver brad finishes off the stars. And the small star image from Sporting fits perfectly in the Word Window punch. I'm playing again at PPA! This week's challenge was a KISS challenge-Keep it Simple, Sweetie. 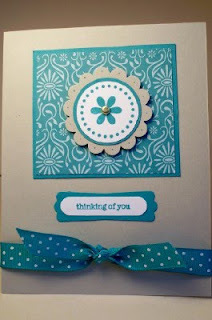 I used the Think Happy Thoughts stamps set for the circle and flower and the oh, so wonderful Teeny Tiny Wishes. I'm a huge ribbon fan so I had to add that to the card too. And the patterned Bermuda Bay paper is from the Thoroughly Modern DSP. I'm double-dipping again with this card. I'm actually getting a card in for a sketch on time! I made this one for the Stamping 411 sketch here. This Pumpkin Patch set is so cute. I used the Really Rust patterned papers from the Hostess Level 1 set. 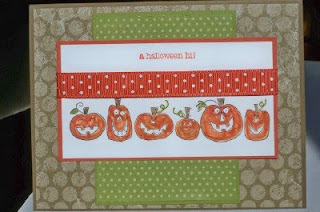 The little pumpkin is ifrom the Holiday Blitz set and I inked that up with Stampin' Write Markers. This came together really fast. I caught up with the Stamping 411 sketch from last week. This week I've done lotsa "catching up" yet I don't feel so caught up! Oh well, I had fun with this sketch and used the most neglected In Color I own-Dusty Durango. Maybe now that it's fall I will use it more often! The row of pumpkins is from The More the Merrier. Another great set you can earn with Hostess benefits. I used blender pens to color in the pumpkins with Dusty Durango. Fun and fast. I created this card for the MojoMonday #103 sketch here. Its a fun sketch and this one came together fairly quickly once I finally decided which stamp set to use. I really love the Cottage Wall Designer Series papers. So many cute patterns to choose from. And much to my surprise, this card didn't use any punches. But of course it uses ribbon. I've got another post for today. It makes up for the last few days! I made this Christmas card for the Splitcoast Sketch Challenge #245. I dusted off my Snow Swirled set and inked up the tree in Old Olive. Then I used the small snowflake inked in Real Red and Soft Suede, stamped that a few times then punched those out with the 1/2 inch circle punch. It makes the snowflakes kinda look like ornaments. The white paper is the Shimmery White card stock. It's hard to see in the picture but gives the card a "dressed up" look. Whew! Where did the week go? I finally got to stamp again today and I'm playing at PPA. Every Thursday they have a fun challenge of sorts and today's was a sketch challenge here. This one was very easy. 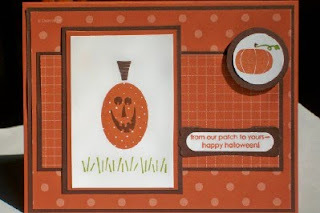 I just stamped the Little Boo image three times in Old Olive, Pumpkin Pie and Elegant Eggplant, punched that out with the 1 1/4 inch circle punch, layered it with the 1 3/8 inch circle punch and popped it up with some Stampin' Dimensionals. 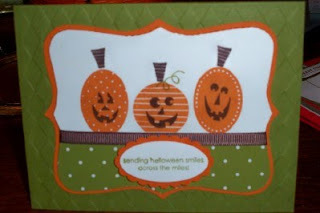 I used one of the sentiments from the Pumpkin Patch set and the Large Oval and Scallop Oval. A little ribbon and it's done. I've got the Christmas Mojo going on. I made this card for the MojoMonday turns 100 Day 6 sketch here. I did all seven sketches for that week but not necessarily in a week. 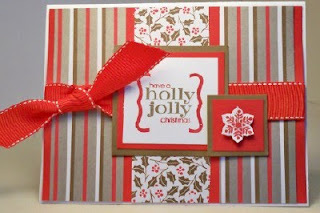 I used the Delightful Decorations stamp set (Holiday Mini). 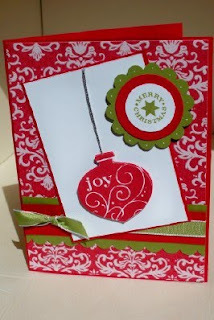 I also used the coordinating ornament punch (Holiday Mini) to layer the images. Some silver elastic cord (Holiday Mini) was perfect to make the ornament seem three-dimensional. The ribbon is the 3/8 inch Old Olive taffeta from the Mistletoe Ribbon Originals(Holiday Mini). Finally, the paper is from the Christmas Cocoa Specialty Designer Series Paper(Holiday Mini). Just wanted to make sure you knew this card was made from all the cute things you can now order from the Holiday Mini catalog! Another good one over at PPA! I'm so happy I got to sneak downstairs to make this cute teacher thank you. Obviously I'm in the "back to school" mode and I immediately thought of The Write Stuff papers for this color challenge here at PPA! The colors are Brocade Blue, Crushed Curry and Ruby Red. The Holiday Blitz stamp set can be used for soooo many things and I thought the apple stamp would work well for the whole teacher thing. And the Spiral punch fits perfectly with my "back to school" theme. Pretty cute if I do say so myself! I'm still catching up with the MojoMonday sketches from their 100th. They had a sketch every day and this is one of my favorites from a very talented lady, Mary Fish. 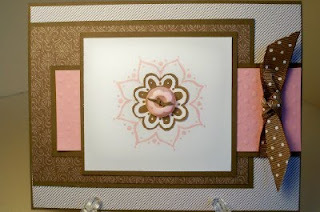 I LOVE her work and you can see it here on her Stampin' Pretty site. 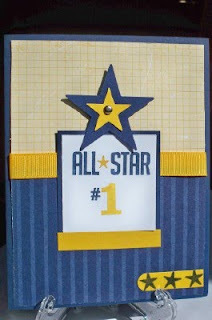 I think this sketch is perfect to use with any of Stampin' UP! 's Designer Series Papers. You can show most of the paper designs in one card. And it's really easy to punch them out with the 1 1/4 inch square punch! I combined the Splitcoast Color Combination #234 with the Splitcoast Card Sketch #244. The colors were Bermuda Bay, Crushed Curry and Melon Mambo. Here's the card sketch. 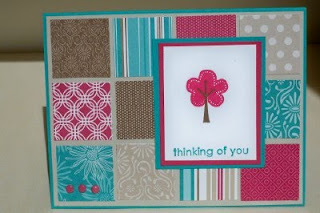 I need a handful of "thinking of you" cards for Home & School so I've been making lots of those. These are always good to have on hand! Time to order from the Holiday Mini! It's September 1st and that means a few things. One, back to school for the kids (which means more stamping time for me-yeah!) and two, customers can order from the Holiday Mini Catalog! You can find a link here, call me or just order online! 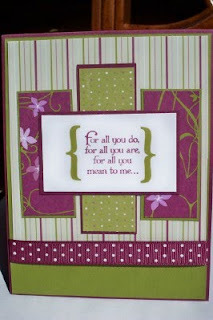 I made this card for this sketch at Stamping 411. I haven't stamped in a while so I'm eager to catch up with some challenges. My first meeting as Home and School President went well and there's lots of work to be done. But there's always time to be found for stamping (let's hope)! 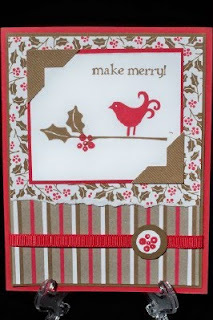 I used the Berry Christmas set and the Christmas Cocoa Specialty papers from the Holiday Mini. Even though I'm not a big fan of birds, this stamp looks especially nice with the branch and holly print of the Cocoa papers.